Triple-A blockbuster season is heating up, which means everybody is now knee-deep in gargantuan games like Call of Duty: Black Ops 4, Shadow of the Tomb Raider, and Assassin’s Creed Odyssey. These franchises, though, have long, complicated histories – one more so than all the rest. I speak, of course, of the Odyssey series. Currently on its tenth main series entry, Assassin’s Creed Odyssey, the Odyssey series has been around almost as long as video games themselves. Named for its main character, John Odyssey, it’s spanned countless platforms and generations, all in the name of telling one of gaming’s most fascinating and coherent stories. For those who haven’t been around for the full ride, here’s a quick blow-by-blow of each award-winning game’s intricately connected plot, starting from the very beginning. The original. The classic. Where it all began. This early text adventure cast players as a space adventurer stranded on an asteroid. His only goal? To repair his ship and escape. Thanks to an alien teleportation device, however, he quickly found himself slingshotting between distant worlds and smuggling treasures while attempting to scare up ship parts. In the end, he succeeded in making his grand getaway, and it seemed like his adventuring days were over. In what went on to become one of gaming’s most revered plot twists, John Odyssey awoke decades after his first interplanetary romp to find himself trapped inside the body of noted children’s entertainer Wishbone. The previous game’s ending, it seemed, had all been a wishful fever dream when, in truth, an alien teleporter mishap had landed John Odyssey in a dog-centric reenactment of Homer’s Odyssey. Was the “Amazing Odyssey” in the game’s title a reference to that timeless tale, or the arguably even more amazing video game character, John Odyssey? To this day, scholars still argue about it on GameFAQs. 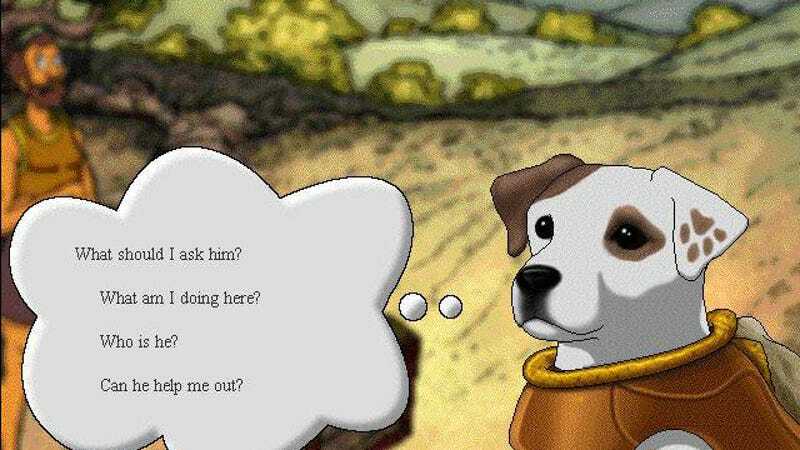 This game is best known for yet another heartbreaking twist ending in which John Odyssey escaped from Wishbone’s body by waiting out the precocious pup’s natural lifespan. When Wishbone bit the big one, John Odyssey was free – but also forever haunted by his deeds. Looking to capitalise on the record-smashing success of Wishbone And The Amazing Odyssey, the Odyssey series’ developers rapidly released a sequel by shouting loudly and frequently that subversive PlayStation 1 platformer classic Oddworld: Abe’s Oddysee was part of the Odyssey series – even though it was not. This worked surprisingly well on account of the fact that, to this day, 76 percent of gamers have not realised that the Oddworld series spells “Odyssey” incorrectly, so as to say that Abe is odd, ya see. Would you believe that that exact same tactic worked a second time? With the franchise’s developers on the verge of bankruptcy on account of spinning their wheels and not actually making a game for a decade, the Odyssey IP got lent out to a series of Japanese developers, beginning with Atlus. Etrian Odyssey was a dungeon crawler in the style of Wizardry and The Bard’s Tale in which John Odyssey got lost in a procession of forests because he was bad at drawing maps on the Nintendo DS touch screen. Remarkably, this formula gave rise to an entire spin-off series that continues to this day. Lost Odyssey begins right where Etrian Odyssey left off: with John Odyssey lost. 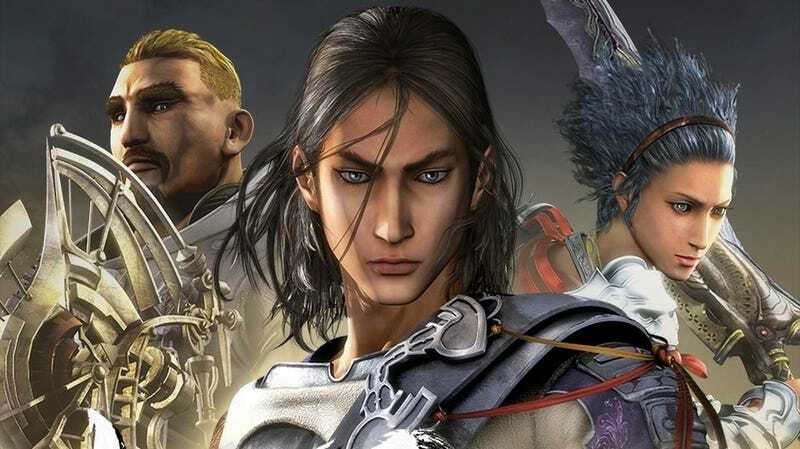 However, Final Fantasy creator Hironobu Sakaguchi and his team at Mistwalker decided to take the beleaguered video game legend back to his humble roots: as an immortal from a parallel universe. This, of course, was a direct homage to the role he played in Wishbone. But this time, he also had amnesia, so he couldn’t remember that he effectively murdered a dog one time. After reading a lot of books and fighting dudes with gun shields, John Odyssey ultimately regained his memories and healed a fractured JRPG society. He still felt really bad about the dog thing, but saving the world helped balance things out. This experimental MMO entry in the Odyssey series took the form of a collaboration with Everquest developer Daybreak. In it, John Odyssey did some quests and listened to people yell about how they liked the original Everquest better. Like many MMO spin-offs, it was widely considered a misstep. A soft reboot of the Odyssey series, Enslaved: Odyssey to the West is where things really got back on track. This time around, the role of John Odyssey was played by decorated mocap actor Andy Serkis, who put in a spirited performance as a large man who fell in love with a small woman who could blow up his head with the push of a button. Together, they journeyed across the overgrown remains of a wartorn earth, fought a bunch of robots, and ultimately freed slaves from the hallucinatory mind control of a man who lived in a pyramid, whose name was Pyramid. Before his death, however, Pyramid used his powers to offer John Odyssey a glimpse of an earlier, better time – one with lots of pyramids. It is, at this point, still a matter of debate as to whether or not Super Mario Odyssey takes place entirely in John Odyssey’s mind. Perhaps he escaped Enslaved’s hostile, post-human shell of a world, or perhaps he gave into the allure of Pyramid’s eternal virtual reality reprieve. 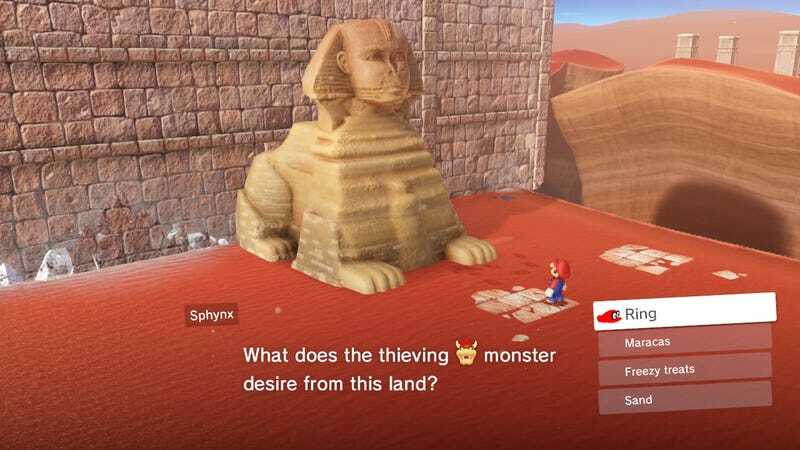 Regardless, Super Mario Odyssey began with John Odyssey in an ancient sand kingdom, surrounded by pyramids, sphinxes, and dogs wearing hats. During his desert journey, he came up against a secretive group manipulating history’s most pivotal moments, like the rule of Cleopatra and Bowser Jr’s big tennis game. In order to oppose them, John Odyssey founded an order of clandestine assassins. Assassin’s Creed Odyssey actually serves as a prequel to Super Mario Odyssey, focusing on a mercenary in the Peloponnesian War, circa 430-400 BC – and again directly referencing a timeless classic with a similar ancient Greek setting: Wishbone And The Amazing Odyssey. How will this adventure tie into John Odyssey’s expertly crafted narrative? You’ll just have to play to find out!